But the good news is - I've finally managed to stitch a little more on the bedlinen .Today I can show you the first little flower block with a description of the stitches used. The main aim which I had while putting this project together was to use as many filling stitches as possible.Let me tell you a little more about the idea behind this project. If you've been a regular visitor here, you would've seen and read about my attempts to learn as many outlining stitches as possible.If you're a first time visitor, you can read all about it here. Once that was done, I wanted to learn about various filling techniques. Ofcourse, I know quite a few, but I hadn't tried any of those in a major project.And most of the time I see a satin stitch or a long and short stitch being used. Hey,not fair!! !give other stitches too a bit of a chance. I've decided that this bedsheet will be the proud bearer of as many filling stitches I can accomodate. Here's the first block. Click on the image for a better and closer view. 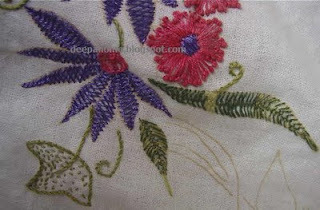 I've used herringbone filling stitch for the purple flowers. 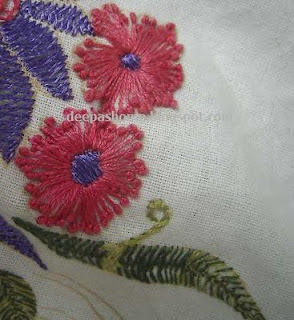 The center of the flower is filled with blanket stitch . I've used the same technique as in the blanket stitched rose .Thanks to rashida for the inspiration. Last time, when I showed a glimpse of the work in progress, many wanted to know the stitch used here. Well, this is a Pistil stitched flower. I used pistil stitch to fill up the petals which gave a totally different look to a very simple flower. 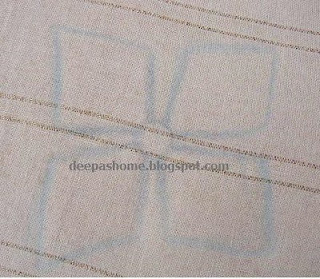 In India, this stitch is also known by the name Lavangam stitch.The center is filled with padded satin stitch. Now about the leaves.I've used both open and closed cretan stitch for the leaves. The completely filled leaves are stitched with closed cretan. One of the leaves has a mixed color - I blended one strand each of two greens to get that shade. 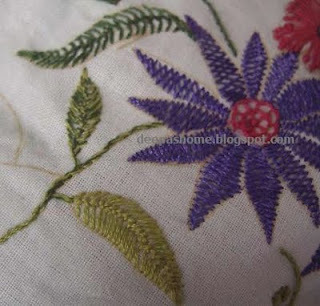 Another section of the same pattern - cretan stitched again,but did you notice the tips of leaves? I started and ended the leaves with a lazy daisy stitch to get a pointed tip. The flat leaf is outlined with stem stitch, and filled with running stitch on one half and seed stitch on the other half. Go back to the first pic to see another leaf filled with stem stitch on one half and running stitch on the other half. Hope you enjoyed this post.I've started working on another block. Hope to be back with another set of stitches soon. So, what do you think about my plan? Is the idea of using as many filling stitches as possible a practical one? I've started facing teeny weeny difficulties - not all filling stitches are suitable for flowers.When I look at a flower, the first stitch that comes to my mind is Long and short ; which in turn is followed by Satin stitch.They seem to be the most suitable for almost all flowers.But I want to avoid repetition as much as possible.Hmm..let me see. This is really turning out well! I am looking forward to your progress on your bed linen. The idea of different filling techinique is excellent. waiting for the next block and the techinique used. I liked the pistil stitch red flower so much and the sky blue satin stitch flower in the last post. The kitchen part- we have no escape. Hi Deepa, glad you escaped the kitchen, if only for a day. I mostly cook from scratch but I'm guessing that my meals are much less involved than yours. Even so, I sometimes wish I was stitching instead of cooking. First of all let me compliment you for running such a simple yet informative blog. I happened to see that you got some iron on inetrfacing ib Blr. Could you please share which shop u got if from?Have been searching so long for it..
Wow Deepa….great job…….I totally enjoyed the post. It’s so nice to know all the details of the block. I think using different stitches is a good idea plus sounds interesting. The best part of working on such big project itself is that you get an opportunity to carry out different stitches that you may have not yet tried your hand till now. By doing so, you can both avoid repetition as well as give other stitches a chance to pose in your bed linen. You are doing a beautiful work. 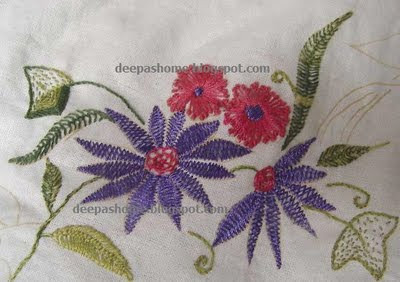 I enjoy looking at the flower patterns embroidered using different filling stiches. What a contrast!! U have switched over to filling stitches from outline stitches for this project, but I am using only outline stitches for one of my current projects for a change!! I am keen to see the other blocks of your bed linen. Wish you find a lot of free time. Another lovely post - always so informative. I am looking forward to seeing your progress on your bed linen. lovely what you've done with herringbone stitch!